This article by John Barnes in the series Clavichords in Britain appeared in BCS Newsletter 3, issued in October 1995. We are grateful to Sheila Barnes for permission to reproduce it here. Minor details in the text have been updated, a photo of the instrument has been added, and more recent items have been added to the Bibliography originally provided by John Barnes. The clavichord described has been much copied and is one of the highlights of the display at the newly re-opened St Cecilias Hall Concert Room and Music Museum, which re-opened after an extensive rebuilding project on 11 May 2017. Details of visiting etc. are given here. This clavichord was owned by Donald Francis Tovey (1875 - 1940), probably from about 1890. He was notable as a pianist, conductor, composer, musicologist and writer, and was Professor of Music at Edinburgh University from 1914 until his death. He was knighted in 1935. He bequeathed the clavichord to his friend Douglas Dickson, whose widow gave it to the Russell Collection in 1980. Mrs Dickson told me that it was given to Tovey when he was a boy by Miss Sophie Weisse, who had adopted him. There is a story that he was playing the clavichord in bed one day when he was unwell and was later reported by the maid to be asleep with a piano on his chest. In about 1956 it was restored by J. J. K. Rhodes and W. R. Thomas who removed strings of probably the correct diameters and substituted thinner ones (a tradition they copied from Arnold Dolmetsch) with their own kind of covered strings up to note e.
In 1974 a workshop drawing was made by Richard Loucks of Pomona College, California, during a sabbatical year he spent in Edinburgh. 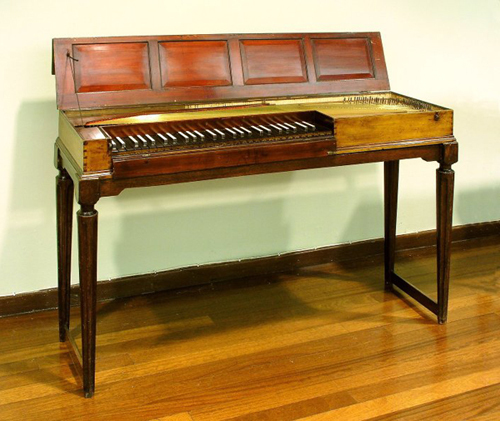 With those of the Hass 1763 and the Anonymous circa 1700, both Russell instruments, which Richard Loucks made at the same time, the three drawings have been immensely influential for the revival of making traditional clavichords. The Hubert drawing has been particularly popular, and I have sold about 180 copies world-wide and supplied 40 sets of covered strings to various builders. Members will be sad to hear that Richard Loucks died last March [i.e. in March 1994]. In 1980 Mrs Dickson asked me for an estimate of the value of the Hubert and was so surprised by the figure I named that she became worried by its presence in her home. This precipitated the gift to the Russell Collection which had been her eventual intention for some time. I undertook its restoration and it was officially received on 27 November 1980. I was greatly helped in choosing the correct gauges by some research by Wolfgang Strack (see below) who discovered a list of gauges glued to the lid of the toolbox of a 1756 Hubert clavichord of similar size and compass. The list stated that it was die ordentliche Beziehung … von dem Meister Selbst angegeben 1761 (the correct stringing ... indicated by the master himself in 1761). The list gives the bottom octave as gesponnen (spun) without giving the exact specifications and it is obvious on the 1784 clavichord that C–B♭ had covered strings because the tangents were hammered at the tops to make them about 2mm thick. This ensures firm contact with the outer spiral of wire. I found a clue to the spacings of these spirals, because old broken covered strings had been trapped under the lid and had left an imprint on the top edge of the case. The spacings were between 0.72 and 0.80mm. While the restoration was in progress, I was surprised to be given a tangent rail which Rhodes and Thomas had previously removed, thinking it unoriginal. It is undoubtedly original and matches several others visible in the photographs in the Strack article. It is now fitted. It would be interesting to exchange ideas in these Newsletters on the various functions of tangent rails. This one is made of cherry only 4mm thick and makes no difference to the touch or the tone. I think it is purely decorative and intended to hide the listing and hitch pins from the view of the player while allowing the paper which decorates the inside of the case to be seen. The compass is C–f³, 4½ octaves, and the speaking length of c² is 253mm, because of which it is kept at modern pitch in the Russell Collection. The width is 357mm, and the length of 1300mm gives a good sound to the covered strings in the bass. Koen Vermeij thinks that this is Huberts portable model, being shorter than the more common size of fretted Hubert with the C–g³ compass and a slightly longer scale (e.g. the one in Liverpool Museum, formerly in the Rushworth and Dreaper Collection). He thinks that his idea is confirmed by the fact that whereas the others are veneered, mostly in oak with herringbone pattern, this one is plain solid cherry. Address: St Cecilias Hall Concert Hall and Music Museum, Niddry Street, Edinburgh EH1 1NQ. Telephone: +44 (0)131 650 2600. Opening: The museum is normally open Tuesay–Friday 10am–5pm, Saturday 12 midday–5pm, except during the month of August when Saturday opening is 10am–5pm. There is no admission charge. St Cecilias Hall now houses the major part of Edinburgh University's collection of Historic Musical Instruments, including the Raymond Russell collection and the Rodger Murray collection. The workshop drawing and photographs are available from The Friends of St Cecilias Hall. Wolfgang Strack, Christian Gottlob Hubert and his Instruments Galpin Society Journal XXXII (1979), pp. 38–58. John Barnes, A theory of soundboard barring, De Clavicordio, Magnano 1993. This contains an attempt to explain the ideas behind three of Huberts barring patterns. Sheila Barnes, The Raymond Russell and the Rodger Mirrey Collections of Early Keyboard Instruments – The Guide, Edinburgh, The Friends of St Cecilias Hall, 2007, p. 72. Koen Vermeij, The Hubert Clavichord Data Book, new edition, London, 2016. Fretted clavichords are unique among stringed keyboard instruments in having built-in evidence of temperament, so my conclusions concerning this instrument may be of interest to the technically-minded. The fretting system used by Hubert is the most common one for German clavichords after about 1730 and is the double-fretting system with Ds and As free. In this case the fretting begins at f, since the notes below would require frets which are too large to be fitted in the space at the back of the keyboard. The frets are f/f#, g/g#, b/b♭, c¹/c#¹, e¹/e♭¹ so on in the higher octaves. These semitones are exactly those which are the small chromatic ones in ¼-comma meantone with the E♭–G# wolf, which was the usual temperament for clavichords until about 1710. The characteristic small and large semitones of ¼-comma meantone (76 and 117 cents respectively) can be seen on most triple-fretted clavichords. Huberts semitones are not 76 cents, however, but 89 cents on average. There is no significant difference between the degrees of the scale. I should explain to those unfamiliar with cents that the equal temperament semitone is 100 cents. There is, of course, no point in measuring the distances at the tops of the tangents, which only yield evidence of the adjustments made by tuners, usually recent ones. It is the position of the tangents at their feet that reveals the intention of the maker (provided they have not been moved) and in many cases, this one included, there is a scribed line along the tail of each key to show where the maker intended to put his tangents. My measurements were taken from these scribed lines, which would have been made by Hubert on the keyboard panel before he sawed the keys apart. Semitones of constant sizes for different notes of the scale are characteristic of meantone and this had led Angelo Mondino, Il Clavicordo, Lucca (1993), p. 109, to postulate that Hubert intended sixth-comma meantone (Silbermann's temperament), the chromatic semitones of which are 89 cents. This is exactly the observed value, but I think it is most unlikely that sixth-comma meantone was in use on clavichords in 1784. I would expect a temperament of the kind advocated by Werckmeister. When we calculate the sizes in an octave of the five semitone frets required for Werckmeister III, we find that C/C# and F/F# need to be 90 cents and the three others 96 cents. Tuning the Hubert to this temperament therefore requires that the C/C# and F/F# frets are very slightly widened by bending the tangents slightly away from each other and that the other frets are widened a little more. In order to produce good clear notes the tangents must be almost vertical, but these adjustments are by a very small angle, too small to spoil the appearance or tone. It is obviously better, if a range of fretting values is required, to set the feet of the tangents to match the smallest of the required frets. It is more economical of space at the back of the keyboard and the tangents which are bent are tilted in a direction which matches the splaying of the keys. To provide a large fret and then have the tangents toed-in towards each other would look odd. I therefore think that Hubert's keys were cut and marked out for tangents in a way that provided the tuner with suitable sizes for any of the temperaments of Werckmeister's kind, sizes which needed only slightly bend- ing of the tangents in directions which would be visually acceptable. Unfortunately this reasoning does not lead to any particular temperament, but only suggests that Hubert was content to leave the choice to the tuner.